It has become a $5.7 billion industry, and Ottumwa, Iowa (pop. 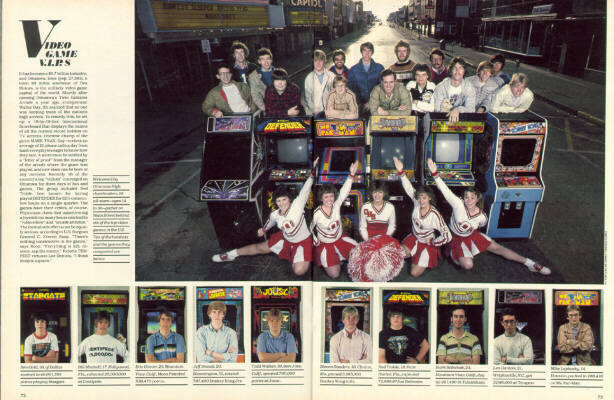 27,381), a town 85 miles southeast of Des Moines, is the unlikely video game capital of the world. Shortly after opening Ottumwa's Twin Galaxies Arcade a year ago, entrepreneur Walter Day, 33, realized that no one was keeping track of the nation's high scorers. To remedy this, he set up a 16-by-18-foot International Scoreboard that displays the names of all the current record holders on TV screens. Onetime champ of the game MAKE TRAX, Day receives an average of 20 phone calls a day from hard-core players eager to know how they rate. A score must be verified by a "letter of proof" from the manager of the arcade where the game was played, and new stars can be born at any moment. Recently 16 of the country's top "vidiots" converged on Ottumwa for three days of fun and games. The group included Ned Troide, best known for having played DEFENDER for 62 1/2 consecutive hours on a single quarter. The games have their critics, of course. Physicians claim that maneuvering a joystick too many hours can lead to "video elbow" and "arcade arthritis." the mental side effects can be equally serious, according to U.S. Surgeon General C. Everett Koop. "There's nothing constructive in the games," says Koop. "Everything is kill, destroy, zap the enemy." Retorts TEMPEST virtuoso Leo Daniels, "I think Koop is a quack." Welcomed by Ottumwa High cheerleaders, 16 all-stars--ages 14 to 30--gather on Main Street behind six of the top video games in the U.S. Ten of the hotshots and the games they conquered are below.